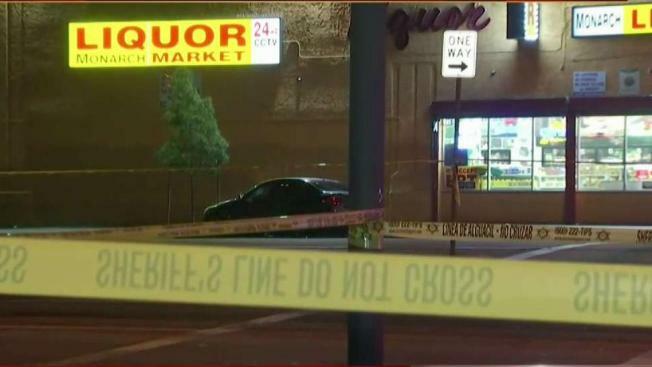 Six people were shot Saturday night outside a liquor store in South Los Angeles with two people dead as a result of the violence. The LAPD Southeast Division confirmed that a call related to the shooting came in at approximately 8:15 p.m.
No description of the suspects was immediately available, but investigators say that a black sedan sped away from the scene. Gil Leyvas and Newschopper4 Bravo arrived over the scene at approximately 8:35 p.m. and witnessed at least two people being transported to a local hospital, another person receiving treatment at the scene and one body covered up by paramedics. LAPD later confirmed that one more person had died as a result of the shooting. Based on Newschopper4's visuals, blood was visible inside Monarch Liquor Store, located at 8801 S. Vermont Ave. in South Los Angeles, but the shooting is believed to have taken place outside the business. The motivation for the shooting is still under investigation, and investigators say it was an apparent drive-by shooting, so not much information is available about the suspects and the getaway vehicle.